I knew something was up with this beer before I even opened up the bottle. You would think a beer brewed by the Carolina Beer Company would be brewed in one of the Carolinas right? Well, think again. The CBC and its flagship ale Carolina Blonde is brewed in Wilkes-Barre, PA! Wilkes-Barre, PA! Wilkes-Barre, PA! (by the way how do you pronounce "Barre"? like "bear" or like "bar" ?) This fraudulent ale not only lies about its location, but it steals money from your pocket. As in this is a crappy tasting beer and I want my $1.79 back. It is very light in color, has a very pungent smell, and the first, middle, and finishing tastes are just plain ol' not great. I was relaxing by the fireplace last night with a nice roaring blaze going, and thought that this 5.0% ABV beer would help me relax some more. It actually did the opposite with its shady self, and made me very irritated (I had a bee in my bonnet if you will). Hell, I didn't even finish the thing, and that's saying something for a guy that doesn't like to waste 3 week old hummus (is that why my stomach hurt last night?). 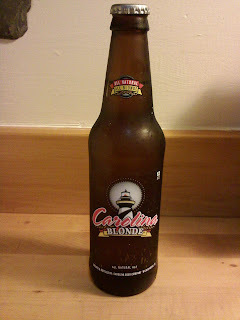 Carolina Blonde, you hustled me, and I feel violated. so is that why you were being such a dingus last night.